Emission reductions – how to pinpoint and cost the best solutions for any vehicle operator? If you are fleet operator you are obliged to reduce emissions for a constantly ageing fleet of vehicles. This is a complicated task as there are many ways that reductions can be achieved. The options depend on many factors. Finding the optimum solution is not easy - reduction costs are typically covered by environmental grants, which are not set up to account for the best overall options compared with the easiest or the most expensive ones. Furthermore, the solution is much better when computerised and calculated on all the parameters. Our task was to estimate the emission created by any fleet of vehicles and optimise the emission reduction strategy. The problem is that the results will vary depending on the vehicles within the fleet, duty cycles, finance available and many other parameters. To evaluate all the possible ways of reducing the emissions in relation to the costs (for example fuel additives, additional exhaust filters or changing the engine to a higher Euro level) and other combinations makes the task very complicated with endless options. Many of the possible reduction methods are in fact free of charge but the applicability will depend on the overall strategy – such as changing the mileage by certain vehicles, reducing the start/stop cycle for older engines, and maintaining the optimum level of tyre pressure and a good level of maintenance of the engine and exhaust system. The system had to calculate and evaluate all the possibilities of emission reduction specific to the fleet of vehicles and then suggest the optimum strategy for the operator. SDART has developed an expert piece of software incorporating an emission reduction calculation algorithm. 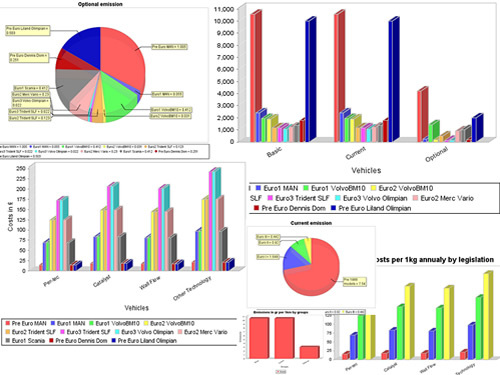 The software enables fleet operators to calculate the emission produced by their fleet of vehicles according to their engine parameters as well as mileage and type of duty cycle. The evaluation enables operators to plan their optimal strategy to reduce emissions. Emission Reduction Expert is the environmental software, which helps people unskilled in this area to choose the proper emission reduction technology (ERT). The software provides optimal supported decisions i.e. the choices recommended by the software allows people to reduce emissions to the full within a planned budged, or achieve targeted reductions with minimal expenditure. This is ideal for companies where ERT is not part of their green policies but investment is normally such that results are matched to expenditure. Our software stimulates green behaviour through simulations that help beginners identify basic measures and gives experts fast access to precise and significant measures. It also promotes the use of emission reduction technology because more companies are likely to install such technologies if evaluation is easy and they can simulate costs and results. This software is a must-have tool for fleet operators, City Councils and organisations interested in emission reduction. It manages vehicle about emission data and provides information about possible improvements to the emission levels generated. This knowledge would help them achieve financial savings and produce documentation of the estimated emission reductions. Cost calculations for implementing the new system are easy to perform and the results easy to verify. The results calculated by the program are presented in a simple graphical form. The software generates reports about the statistical data and helps build a strategy for the future investment of the company.